Bernice Summerfield – In Time will be released next month, when we’ll be able to immerse ourselves into the multiple lives and timelines of Bernice Summerfield once again. Each of the brand-new stories in this collection focuses on a different time in Bernice Summerfield's life. From her very beginnings through studying in the military academy, looking after the Braxiatel Collection, the world of Legion, into the Unbound universe, and beyond – into the far future! Here are more details on the stories and where they fit into the chronology of Benny. From a rocky start at military academy to her sudden immersion in an alternative universe via a variety of jobs and adventures on Dellah, at the Braxiatel Collection, and in the murky world of Legion – Bernice Summerfield is a woman who can be said to have lived more than one life. But one thing's for certain: wherever she is, Benny can always be counted on to right wrongs, get the job done and, sometimes, even have a good time along the way! Set in Benny’s past there’s Oh No, Not Again by Dave Stone (could this be set around the first ever Benny story Oh No, It Isn’t!?). From Benny’s youth at the Spacefleet Academy we’ve The Bunny’s Curse by Doris V Sutherland. On the planet Dellah is The Seventh Fanfic by Mark Clapham. In the Braxiatel Collection, Simon Guerrier has written, Benny and the Grieving Man and in Legion City, there’s Wurm Noir by Antonio Rastelli. In the Unbound Universe there are two stories, Legacy Presence by Victoria CW Simpson and The Death of Hope by James Goss. And to finish off in Benny’s future there’s Old Ruins by Peter Anghelides. We’re very lucky to have writers from Benny’s past (such as Simon Guerrier, James Goss and Peter Anghelides) in this collection. And we are also delighted to be introducing new writers, Victoria CW Simpson and Antonio Rastelli, plus Doris V Sutherland – the winner of the Big Finish writer’s opportunity run with The Time Ladies. Doris told us about writing for Bernice Summerfield and Big Finish: “I'll be honest, I'm actually very new to Benny. But I'm making up for that by giving myself a crash-course in her exploits. The whole idea of a far-future archaeologist appeals to me; there's plenty of room for irony in that concept. That she has such a dry, sardonic outlook on her adventures is the icing on the cake. Actor and first lady of Big Finish, Lisa Bowerman, described how she felt about playing Benny for the last 20 years: “Date: 25th June 1998. Scene: a damp cellar in Elephant and Castle. Arrive to find a couple of hippies, a cast of panto characters, Gary Russell, Nicholas Briggs on a stool, a man in a corner with a DAT machine, Nicholas Courtney, one microphone – and a moth eaten cat. Not the most auspicious start to a job; which frankly I thought would last a couple of days! “Cut to: 25th June 2018. Email is now a thing – and I get a message from Big Finish’s marketing guru, Paddy Freeland, to tell me Benny’s licence has been extended to 2023! “Never in a month of Sundays could I have imagined on that day 20 years ago that the adventures of Professor Bernice Summerfield would still be going. It’s been two decades of danger and excitement (and that was just some of the studios we recorded in!) – brilliant writing, great adventures, wonderful casts, directors and producers – and the beginnings of what would be an astonishingly successful audio production company. 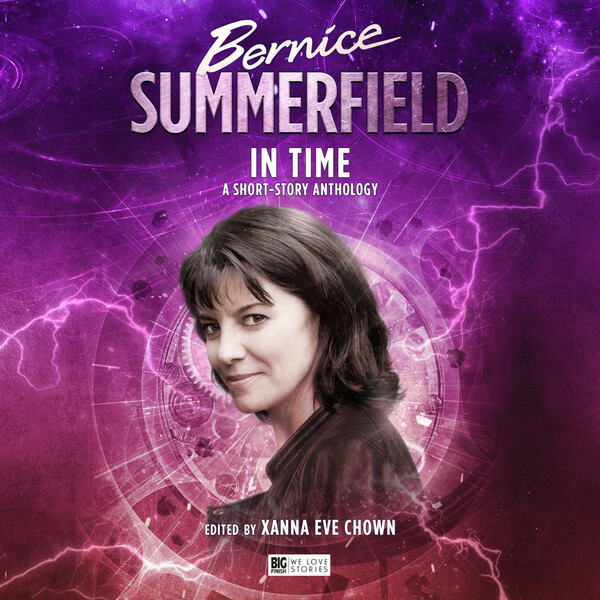 Bernice Summerfield: In Time will be available in December on ebook at £12.99, hardback at £16.99 and as a digital audiobook read by Lisa Bowerman at £9.99. And don’t forget if you’re itching to hear more adventures with Benny, two box sets – The Story So Far Volumes One and Two – were released in September as part of the 20 years celebrations.